Does your old flooring need some renovating? Scheduling a free carpet installation estimate is the best way to find the new carpeting you want most. Thirty years of experience has shown us that customers are looking for the best quality products at prices that are fair. That is exactly what we provide. Let us be your one-stop carpet shop for all your flooring needs. We have what it takes to get your floors installed correctly and we promise you’ll be satisfied. As soon as our installers arrive at your home, your furniture will be moved out of the rooms at no extra charge. After the rooms have been cleared, the old flooring is torn up, bundled neatly, and placed outside by the curb (if applicable). Once the old flooring has been taken out, fresh carpet pad is rolled and the new carpeting is placed on top and installed. Once the install is complete, the remnants are taken out of the rooms and the furniture is put back the way you had it. Ready to get new flooring installed from the best carpet dealer in Salem? 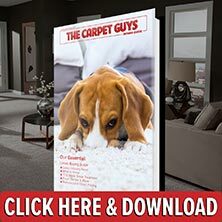 Get your free estimate booked with The Carpet Guys today. We are standing by, ready to give you the carpeting that you want most.